I am a huge fan of GOSH Cosmetics and a few weeks ago I went along to the launch of the AW14 range. Held in the fantastic location of The Sanderson Hotel, we were treated to the most delightful little canapes, Lychee lemonade and a few glasses of bubbles not to mention make-overs and manicures. The AW14 range is a really exciting one for me, particularly with the nail polish. I am one of those people who prefers the darker shades to the lighter ones and my manicure was done with Night Sky which at £3.99 is an absolute steal. As you can see from the photo's below, this colour is a black but within it are little speckles which shimmer in the light. Also within the range are 4 other shades called Stardust, Milky Way, Moonlight and Million stars. Then there is the Defining brow gel, brows seem to be the 'in thing' right now and GOSH have brought out their defining gel which is Vegan friendly and available in three shades; Brown, Brown/Grey and Black. They are priced at £4.99 each. More mascara, well you can never have too much. There are two new ones coming from GOSH and they are - the Crazy Volume Mascara (£6.99) which has a large brush, it is designed to give you that big lash look. The second one is the Double Precision Mascara (£7.99), this one has not one, but two wands and they work together to help define both your upper and lower lashes. Both mascaras are paraben and fragrance free. Lipsticks - GOSH have added eight new shades to their range of velvet touch lipsticks; Adorable, Temptation, Divine, Scarlet, Diva, NightKiss, Twilight and Angel. These are full of pigment and last well, but also soften the lips thanks to the Vitamin E. Each lipstick is £6.49. Unfortunately there’s no swatch of NightKiss. Cheek blushers - These I absolutely love and couldn't wait to try them. They come in three stunning shades which are called Shy, Passion and Pink Parfait. At a first glance, they do look similar to the chubby sticks from clinique. What I love about them is how easy they are to hold and how little you need to apply to your cheeks to get this fabulous colour not to mention the fact you can also use them on your lips, so it is like having two products in one! The Palettes - The first item I spotted as I walked through the door was the amazing palettes. I have a bit of a thing for palettes at the minute and as soon as I had said hello to a few people I was swatching away. Available in three different options 001 To Enjoy with in New York, 002 To have fun with in LA and 003 To Play With In Vegas each palette has a multitude of options for everyone, whether you like your nudes, bright colours and I mean really bright or something which is halfway between the two, these palettes are simply stunning and a first from GOSH. The final two items are the Mineral Powder and the brush to accompany it. Priced at £9.99 this powder is said to give really good coverage to leave a flawless complexion. The shades available are 02 Ivory, 04 Natural, 06 Honey and 08 Tan and I am between the 02 and 04 shade from the swatches I did on the back of my hand. Once on the skin they blend in really well and definitely something I will be looking to purchasing. What do you think to the GOSH AW14 range? Are there any products which take your fancy? This looks an amazing event, I would have loved to have gone but I live in South Wales. Maybe Gosh could organise something near me in the future, it can be a bit disheartening when a lot of the PR companies organise events mainly in London. I love that first eye shadow palette it looks great. This sounds like a great range, love the price tag! oh those eyeshadow paleetes look amazing!! i hope they'll stock them here as well!! I don't think I ever had anything from GOSH but love their grey nail polish range! Never tried Gosh products before the lipsticks and mascaras look great! I love this new range from Gosh. Lots of great basics these, would keep my make-up bag very happy. 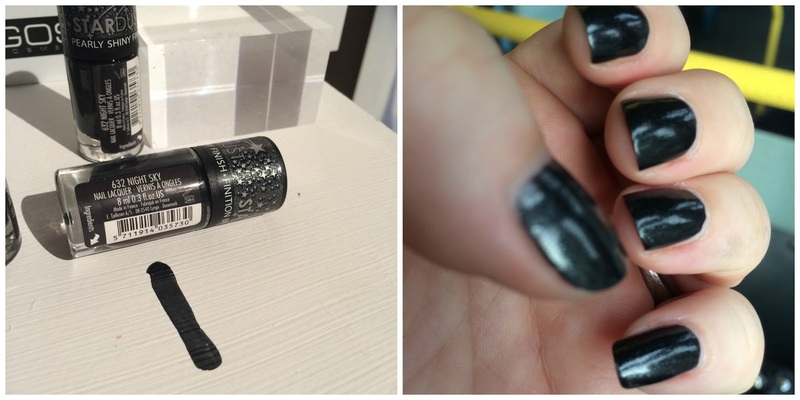 I've never heard of GOSH, but their cosmetics look fab - love the black nail polish! A brand I've not tried yet, looks and sounds amazing. Looks like a great event with great products. And wow what a goody bag! I would go for the mineral powder with brush! They sound like great products, where can I find a stockist? I like their mascara. The whole range does look rather exciting.